Introduction: When Cyrus Field died in 1892, most of his estate was left to his children (see this article on Cyrus Field's will for details). 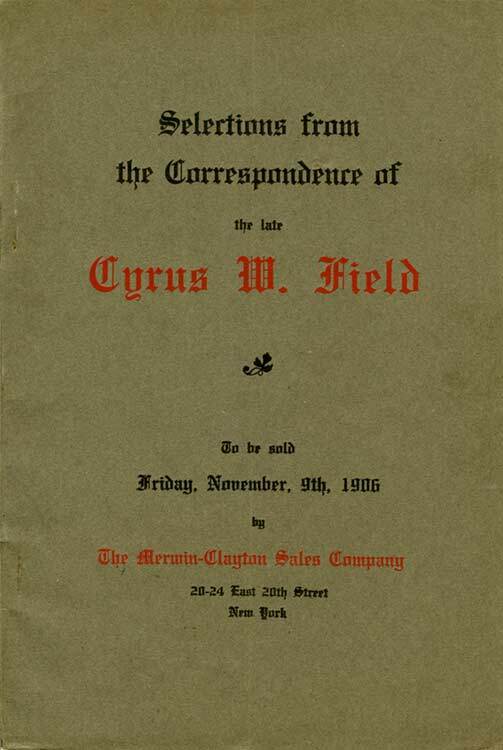 In November 1906 the Merwin-Clayton Sales Company, located close to Field's Gramercy Park home in New York City, held an auction of “Selections from the Correspondence of the late Cyrus W. Field”. The consignor is not identified, but it was presumably one of Field's children. I have included here the introduction to the catalog, and all the lots which relate to Field's life and his involvement with the Atlantic Cable and submarine telegraphy. At the end is a report on the sale from the New York Times. prominent men of the time. Books of Reference and Bibliography. A Collection of Autograph Letters, Manuscripts and Documents. Payne, J. G. Saxe and other American Authors. Beginning at 3 O'Clock P. M.
Born of sturdy New England stock, and inheriting a capacity, energy and perseverance that overcame all obstacles, he rose from poverty to wealth through various vicissitudes, engaging in gigantic enterprises with the risk of financial ruin, until after thirteen years of tireless labor with alternations of hope and fear, of success and discouragement, his triumph came, and with it world-wide fame and honor. A man of untiring energy, rare executive ability and vigorous thought, he was not content to retire after the successful completion of his great work but devoted the rest of his life to many other business enterprises which were of great value to his city and country. Among them may be mentioned his part as promoter of the elevated railroad in New York city at a time when its feasibility was problematical and success uncertain, a task which by itself would have entitled him to the grateful memory of our people. Mr. Field's great work brought him into contact with all the prominent men of the day both here and abroad, with many of whom he formed intimate friendships lasting during his lifetime. These included Gladstone, John Bright, Matthew Arnold, Chief Justice Chase, Longfellow, Whittier, Bryant, Holmes, Justin McCarthy, Thomas Hughes, Deans Farrar and Stanley, General Sherman, Horace Greeley, and many others. The collection described in this catalogue comes direct from his estate and includes letters from many of the famous men noted above. Among them is a series of remarkable letters from Gladstone written during and just after the Civil War, expressing his views on the war and other subjects of national interest, forming one of the most interesting collections of Gladstone letters extant; and many personal letters of John Bright with whom Mr. Field was probably more intimate than any other American, containing his views on our Politics, Free Trade and Protection, as well as personal opinions of prominent contemporary Americans. This catalogue also includes a small portion of Mr. Field's library with many rare pamphlets and works relating to the Atlantic telegraph; Proceedings, Reports and other data of the various telegraphic companies in which he was interested, Scrapbooks, scarce contemporary accounts, Prints and Views of the cable work collected by Mr. Field himself, Commemorative Poems and Addresses delivered upon the successful laying of the cable, and the Original Cablegram of the first public message ever sent across the ocean. Aside from its historical value, the collection is unique in that forms a complete history of the Atlantic Cable from its conception to its completion. 70. A.L.S., 3 pp., 8vo, London, Feb. 25, 1855. Fine letter on personal and family affairs. 75. FIELDS (JAMES T.). Poet. A.L.S., 1 p., 8vo, Boston, Nov. 11, 1864. 77. FLORENCE (WILLIAM J.). Popular Actor. A.L.S., 1 p., 8vo, invitation to a performance at Wallack's Theatre. “;We have arranged a representation of the Laying of the Cable by the United States steam Frigate Niagara,” etc. The following collection of Pamphlets, Documents, etc., relate directly to the Atlantic Cable, and are contemporary with its construction. They constitute a mass of information relating to this great event, of the highest interest and importance. They are all directly from Mr. Field's library, many with his autograph and some privately printed. It is impossible to duplicate many of the items here described. 170. ATLANTIC CABLE. Cezanne (E.). Le Cable Transatlantique. 24mo, paper. Paris, 1867 (Presentation copy to Mr. Field in the author's handwriting); Menu, Dinner given to Mr. Field. Rome, 1872; Proceedings at the banquet held in honor of Mr. Field in Willis' Rooms, London, July 1, 1868, and another. 3 pieces. 173. Recovery of the Lost Cable ; Banquet to Mr. Field at Star and Garter Hotel, Richmond, on 27th anniversary of the First Atlantic Cable. Lond. 1886. On the submergence of the Atlantic Cable. By Capt. M.S. Nolloth, R.N. (Presentation copy from the Author to Mr. Field.) Memorial of the Magnetic Telegraph Co. to the Congress of the U.S., 1858; Ocean Telegraphy, the 25th Anniversary, 1879; and other interesting Field material. 8vo and smaller, paper. 20 pieces. 174. Miscellaneous Report, Speeches, and Papers on the practicability of the proposed North Atlantic Telegraph. Lond. 1861. Journal of the Voyage of the “Great Eastern.” [1865.] (Torn.) Reports of the Meetings of the Atlantic Telegraph Company, 1861-65 (13); Prospects of the Atlantic Telegraph, a paper by C.W. Field, 1862; Reports on Valencia Harbour as a Western Packet Station, 1858; and other scarce items, one with Mr. Field's autograph. 8vo and smaller, paper. 25 pieces. 175. The Atlantic Telegraph, a descriptive History. Chart. Lond. 1857; Bacon's Chart of the Atlantic Telegraph ; Address of Prof. Wm. Thomson on the Cable, 1866; Two Worlds United. A Discourse by Rev. Dr. Scott. San Fran. 1858. Jenkin (Fleeming) on the Construction of Submarine Cables. Plates. Birmingham, 1862; and other scarce and interesting cable pamphlets, some with Mr. Field's Autograph. 8vo and smaller, cloth and paper. 15 pieces. 176. The Atlantic Telegraph, A Descriptive History. Map. 1857. Statistics of Telegraphy, 1872; Authorship of the Practical Electric Telegraph of Great Britain, 1868; Anglo-American Telegraph Co. Agreements. 8vo, cloth and roan, and other pamphlets, 8vo, paper. 13 pieces. 18o. Maps showing Telegraph Lines in Operation and contemplated to complete Circuit of the Globe; U.S. Coast Survey of Atlantic, Gulf of Mexico and Pacific Coast of the U.S. to 186o (with Mr. Field's proposed plan of connecting Washington and Southern Points by Telegraph in red ink); China, from Hong Kong to Liau-Tung, 1867, folded on linen; North Pacific Ocean, folded and mounted on linen; The Broadway Underground Railway, Route and Plan of Construction, and Construction Drawings from London Underground Railways. Folio, cloth. 19 pieces. 181. The Atlantic Telegraph. By W. H. Russell. Illustrated by Robert Dudley. Fine Lithos. Royal 8vo, cloth (loose in binding), gilt. Lond. n.d.
183. Field (C.W.). What Can be Seen in Thirty Days. (From St. James Magazine, Aug., 1874); Deane (J. C.), Narrative of the Atlantic Telegraph Expedition, 1865 (from Macmillan's Magazine); The Laying of the Atlantic Cable, 1865 (from Blackwoods); Photo Fac-simile of Medal presented to Mr. Field, mounted; Blundell's Manual of Submarine Telegraph Companies,. 1872; Appendix to the History of the Atlantic Telegraph. 8vo and smaller, cloth and paper. 25 pieces. 184. Ocean Telegraphy. The Twenty-fifth Anniversary of the First Company ever formed to lay an Ocean Cable. N.Y. Mar. 10, 1879. Frontis. 8vo, paper. For private circulation only . (2 copies.) 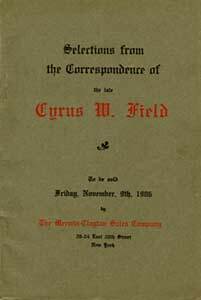 Testimonial of Friendship to Cyrus W. Field. N.Y., Oct. 26, 188o. 8vo, paper. (2 copies.) And another. 5 pieces. 186. Two Large Scrapbooks collected by Mr. Field, containing contemporary newspaper clippings and illustrations from English and American papers and magazines, relative to the Atlantic Cable, including personal opinions of the undertaking from the great men of the day, scarce illustrations of the “Great Eastern,” and other vessels engaged in the work of laying the cable, editorials, criticisms, addresses, programmes, etc., the whole forming a complete history of that great event as collected by the inventor himself. The importance of this unique collection can hardly be overestimated. 2 vols. Folio, boards. 220. The same. (6 copies.) 8vo, paper. His Attitude on Our Civil War. My Dear Sir: I thank you very much for getting me the “Thirteen Months.” Will you think that I bely the expression I have used if I tell you candidly the effect this book has produced upon my mind? I think you will not. I do not believe that you or your countrymen are among those who desire that any one should purchase your favour by speaking what is false or for forbearing to speak what is true. The book, then, impresses me even more deeply than I was before impressed with the heavy responsibility you incur in persevering with this destructive and hopeless war, at the cost of such dangers and evils to yourselves, to say nothing of your adversaries, or an amount of misery inflicted upon Europe such as no other civil war in the history of man has ever brought upon those beyond its immediate range. Your frightful conflict may be regarded from many points of view. The competency of the Southern States to secede, the rightfulness of their conduct in seceding, (two matters wholly distinct and a great deal confounded,) the natural reluctance of Northern Americans to acquiesce in the severance of the Union, and the apparent loss of strength and glory to their country; the bearing of the separation on the real interests and on the moral character of the North; again, for an Englishman, its bearing with respect to British interest—all these are texts of which any one affords ample matter for reflection. But I will only state, as regards the last of them, that I for one have never hesitated to maintain that, in my opinion, the separate and special interests of England were all on the side of the maintenance of the old Union; and if I were to look at those interests alone and had power of choosing in what way the war should end. I would choose for its ending by the restoration of the old Union this very day. Another view of the matter not to be overlooked is its bearing on the interests of the black and colored race. I believe the separation to be one of the few happy events that have marked their mournful history. And, although English opinion may be wrong upon this subject, yet it is headed by three men, perhaps the best entitled to represent, on this side of the water, the old champions of the antislavery cause—Lord Brougham, the Bishop of Oxford, and Mr. Bunton. I am, in short, a follower of Gen. Scott. With him I say, “Wayward sisters, go in peace.” Immortal fame be to him for his wise and courageous advice, amounting to a prophecy. I should not have used so largely in this letter the privilege of free utterance had I not been conscious that I vie with yourselves in my admiration of the founders of your Republic, and that I have no lurking sentiment either of hostility or indifference to America; nor, I may add, even then had I not believed that you are lovers of sincerity and that you can bear even the rudeness of its tongue. I remain, dear sir, very faithfully yours. The above was sold for $101 to James F. Drake. It is said to be a record price for a Gladstone letter.